Inter-AS Option A uses back to back vrf connections between the ASBR routers. It provides one of the solutions for running MPLS over two BGP ASes. This might be required if two carrier merge, or if one customer is connected to two carriers and would like to maintain end to end MLPS VPN. In the Diagram 1, R1 and R5 are ASBRs that have two subinterface, each belonging to its respective vrf: blue and red. The links between R1 and R5 can run different routing protocols. Simplest options, seen in many network Inter-AS connections. Deployed using a single subinterface between providers' ASBRs. Subinterface has each customer's VRF instance that needs to be exchanged between ASNs. No exposure of provider's complex routing policies. Don't need to exchange any internal routing information, but only what they would use with customers. No label exchange, IPv4 forwarding for packets between the ASBRs. Connection between providers is like any CE-PE using either IGP or eBGP protocols. RD and RT are locally significant to each carrier. The PE to PE has to maintain all VRF routing tables. This could be a scalability issues. Routing between ASBRs can be use the customer's native IGP protocol such as OSPF, EIGRP or RIP. OSPF - OSPF has an issue with DOWN bit when used on a vrf enabled interface. Capability VRF Lite can be enable to circumvent DOWN bit filtering, but it will disconnect the PE from superbackbone and not reassemple OSPF routes (LSA Type 3), but only redistribute as LSA Type 5s. See eBGP below. RIP - No issue re-assembling RIP routes. EIGRP- No issue re-assembling internal EIGRP routes. eBGP can also be used to exchange routes between ASBRs. The biggest benefit is that extended BGP communities can be used to maintain IGP metric transparency over the Inter-AS MPLS networks. This option should fix the OSPF issue stated above. Significance of this traceroute is the that it can be derived that hop 4 is the ASBR hop for this VPN. The previous hop stripped transport label 16 and used VPN label 16006 following that a stack of 16/21 was pushed. The ASBR link forward packets unlabeled. Use native IGP between ASBRs such as EIGRP, OSPF or ISIS. For eBGP to work, a separate session has to be configured for each vrf. If extended communities are exchanged, customer's routing protocols can reassemble internal prefixes like OSPF LSA 3 or EIGRP internal routes. Without it, everything is redistributed and considered external. With EIGRP make sure that the same EIGRP AS is used to maintain EIGRP route information over the MPLS core. There are no issues with having both CE (each attached to another BGP AS) see internal EIGRP routes propagated over the ASBR links. OSPF introduces a number of issues to this Inter-AS scenario if LSA 3 routes are desired by the CEs. If not, all routes carried over the Inter-AS MPLS cloud will be external. To run OSPF, you have configure the capability vrf-lite on each ASBR. Without that option, each ASBR will block the other's routes (downwards bit set). 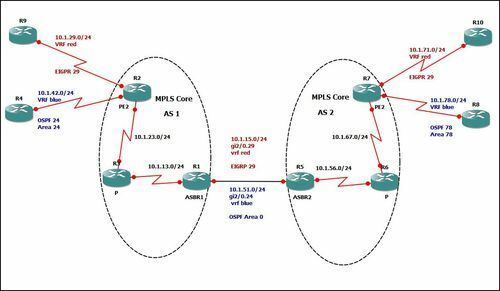 Remember that these routes will be reassembled from MPLS into OSPF as LSA type 3 if the were natively advertise. For example, in diagram 1, the ASBR2 would block all OSPF LSA type 3 routes from ASBR1 and vise-verso. This is due to the OSPF loop prevention mechanism enabled on OSPF process running over a VRF. Enabling the capability vrf-lite command, disables these checks. At the same time it also disconnects the ASBR from the superbackbone area. Because of the disconnect, OSPF routes are not reassembled from MPLS to OSPF, but only redistributed as LSA type 5. To get LSA Type 3 routes working between the CE networks, R4 area 24 and R8 area 78 in diagram 1, you'll have to configure Sham Links. The sham-links extend the edge areas to the ASBRs as LSA Type 1s, preventing the whole reassemble problem. In fact "capability vrf-lite" does not have to be configured on the ASBRs when you are using sham-links. In the diagram 1, sham-links should be created between R2 and ASBR1 for area 24;R7 and ASBR2 for area 78.